This is a short video I posted as I reached Goro 2, about 14,000’/4,267m in 2014 as I trekked to K2 Base Camp. 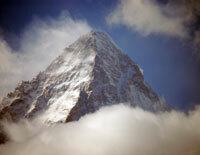 Canadian Nathalie Fortin is at K2 Base Camp and says the weather has closed in “There’s a lot of wind and clouds. We haven’t seen the mountain for 4 days. The rise to the advanced base camp was beautiful through the glacier and cracks. You had to be careful. There was no fixed rope.” She is with teammates Serge Dessureault, Maurice Beauséjour. It has been bad weather for more than 10 days now! The prediction does not look good for the next 6 days either. More and more snow. There is a wind from the SW that is bringing allot of snow to Nanga Parbat and up in altitude the risk of avalanches has increased a lot. We can climb to about 6000m more or less safely but higher we can not go! It is very frustrating. All we can do is wait for the weather to change! But the question is when will it change! In the Gasherbrum basecamp it’s getting crowded, there are people from Austria, Hungary, Ukraine, Italy, Germany, Switzerland and Slovakia. So far nobody has managed to establish c1. Well, we’ll give it a try. Tomorrow I’m going with Jacek up and there are a few km of nasty glacier ahead of us so keep your fingers crossed! He is with Polish climber Jacek Czech and Felix Berg. They are targeting the Gasherbrums, starting with GII, then hoping to open a new route on the East Face of GIV. My fellow blogger, Stefen Nestler reported that 34 year-old Austrian Hansjörg Auer will do a solo attempt of the West Face of the 7,181-meter-high Lupghar Sar West. As usual, teams across Pakistan are commenting on the weather. It’s a bit unusual for trekkers to say its “cool” but not for the K2 climbers to talk of the Hill covered in cloud for days on end. But it’s the start of a month long season so a lot will happen. Stay tuned!! Thanks Alan, you’re the best!! Thanks Alan. I was wondering when the next update would be available. Not much information is available while they are trekking in but should pick up soon. Thank you Alan! Awesome coverage and photage.